Prime numbers. Who doesn’t love them? They have a special place in mathemathics and also very useful in many areas, especially in cryptography. Since I know there are some repetitive patterns about primes, I started out writing all numbers from 1 to 120 on a paper. 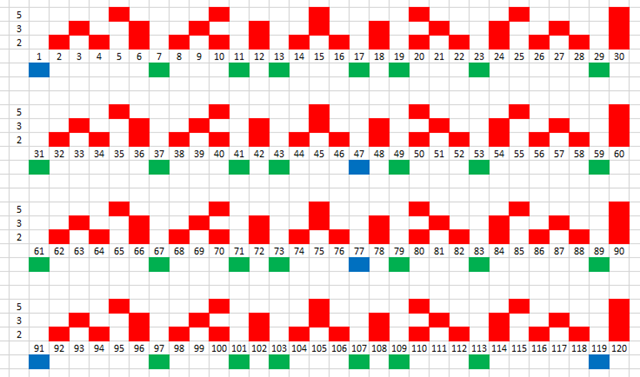 I segmented the number in partitions of 30 because the first 3 prime numbers 2, 3 and 5 have a product of 30, and this pattern repeat itself since no other prime can have 2, 3, or 5 as a factor. As you can see in the image above, the red blocks are the numbers that are definately not a prime number. 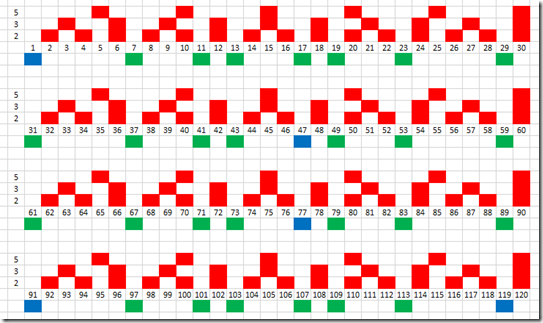 Left are the green and blue numbers that are possible prime numbers candidates. As you can see, there are now only 8 candidates in each partition. In reality there are only 7 since at least one possible prime number candidate is false. 1 is per definition not a prime number, 47 is the product of 7 and 7, 77 is the product of 7 and 11, 91 is the product of 7 and 13, and last 119 is the product of 7 and 17. With this information, I only have to test 8 of 30 numbers in each partition, ie only 26.67% of the numbers, a significant improvement. I decided that creating a certain number of partitions up to the wanted prime number should be enough. Further, I don’t have to check 2, 3, and 5 because these numbers already have been used to set the partition size (named x). The first number I have to check is 7 (x – 23). The following numbers are 11 (x – 19), 13 (x – 17), 17 (x – 13), 19 (x- 11), 23 (x – 7) and 29 (x – 1). But since I have offset the sequence by seven numbers I have have to include 31 (x + 1). Now I have all my prime number candicates and I save these in a temporary table. If I for example want to display all prime numbers up to 1 000 000, I only have to store 266 672 prime numbers candidates. Now when I have all my prime number candidates, all I have to do is to check of there exists a prime number as a factor of the larger prime number candidate. And it is common knownledge you ony have to check for a factor up to the size of square root of the largets prime number. This is the final code to produce prime numbers very fast. This algorithm produces all prime numbers (78 498) up to 1 000 000 in less than 1.5 seconds on my laptop. I have tried to include 7 as base prime number to increase the partition size to 210, but the 48 prime number candidates (22.86%) didn’t improve the performance much.